Hilda (known in her own century as "Hild") was the grandniece of King Edwin of Northumbria, a kingdom of the Angles. She was a nun and established several monasteries. Her last foundation was at Whitby. It was a double house: a community of men and another of women, with the chapel in between, and Hilda as the governor of both; and it was a great centre of English learning, one which produced five bishops. The Celtic peoples of Britain had become Christians well before 300 AD, but in the 400's and 500's a massive invasion of Germanic peoples (Angles, Jutes, and Saxons) forced the native Celts out of what is now England and into Wales, Ireland, and Scotland. and west by the Celts, and in the south and east by Rome. Roman and Celtic traditions differed, not in doctrine, but on such questions as the proper way of calculating the date of Easter, and the proper style of haircut and dress for a monk. It was, in particular, highly desirable that Christians, at least in the same area, should celebrate Easter at the same time; and it became clear that the English Church would have to choose between the old Celtic customs which it had inherited from before 300, and the customs of Rome that missionaries from there had brought with them. In 664 the Synod of Whitby met at that monastery to consider the matter, and it was decided to follow Roman usage. 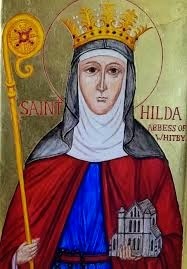 It shows the importance of St Hilda and her monastery that Whitby was chosen for this Synod. Hilda herself greatly preferred the Celtic customs in which she had been reared, but once the decision had been made she used her moderating influence in favour of its peaceful acceptance. Her influence was considerable; kings and commoners alike came to her for advice. She was urgent in promoting the study of the Scriptures and the thorough education of the clergy. She died in 680 and her saint’s day is celebrated on 19th November.